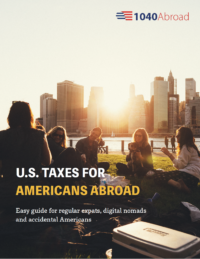 Most of the Americans abroad prefer to use Foreign Earned Income to save money on the tax bill. However, if you ask a tax professional, they will always recommend using the Foreign Tax Credit instead. It has some massive advantages that U.S. expat should be aware of before making a decision to choose one of the options. Would you like our help? Contact us now and we will respond to you within 24 hours. Limited time deal: We offer 20 min free call, which has already helped dozens of U.S. expats to get guidance and gain clarity. Book your time now and our tax professional will call you! Is a retired senior Lebanese green card holder whose total yearly income from his saving accounts at Lebanese banks, exempted from the physical presence test due to his residence in USA for an approximate period of 9 months per year. For claiming the specific foreign income tax exemption ?? In order to qualify for the Physical Presence Test of the Foreign Earned Income Exclusion, a Taxpayer has to be physically outside the United States for more than 330 consecutive days during the 12 month period. Therefore, spending more than 35 days in the United States during a 12-month period will mean that you cannot claim Foreign Earned Income Exclusion and Physical Presence test. Yes, you need to spend 330 days outside the US to pass a physical presence test.